Have you ever thought of using a hair mask for dry hair? There is no bigger road block to fabulous hair than hair that is dry, brittle, coarse or frizzy. There are many causes of dry hair—some we can control, others that are out of our hands—but thankfully there is also an easy solution. Weekly hair masks for dry hair can help restore vibrance. 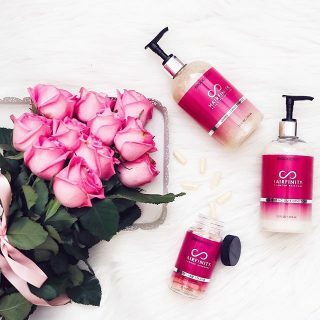 You must also be sure to use products that are designed to work with your body’s pH to gently cleanse, hydrate, and revitalize your hair such as HAIRFINITY Haircare, an aloe vera based hair care system. We have collected some wonderful, restorative hair mask recipes to help you find a hair mask for dry hair that’s just right for you, but first let’s talk about some causes for dry hair, both natural and environmental. When it comes to dry hair, some of us are born with it. Dry hair might not show up in infancy but as we age the dryness increases, just as it does with our skin. Some people are born with straight hair, others with natural curls, and the same goes for dry, coarse hair. Perming, relaxing, foiling, tinting, and bleaching rob hair of moisture, over-processing is one of the most common causes of dry hair. Perming or straightening the hair rearranges the chemical bonds of the inner hair cuticle. Bleaching or coloring hair removes or adds pigment to the inner structure. Overuse or improper use of these harsh products weakens the strands and can damage the hair overtime. Whether from the blow dryer or the sun, too much heat dehydrates and weakens our hair. Even as we’re trying to make our hair look better we may be contributing to its dryness and damage. 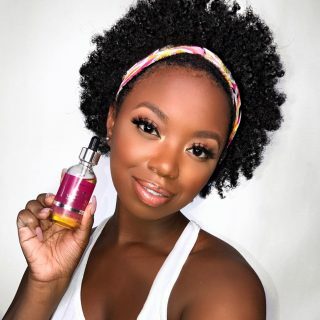 Always use a heat protectant, whether it is a spray on or a leave-in conditioner that is also a heat protectant – do not skip it if you want to save your strands. Another cause of dryness is brushing too frequently, improperly, or with the wrong kind of brush. Hair should always be brushed from roots to the ends, to massage and stimulate the scalp in an effort to distribute the sebum throughout your hair. Extreme weather and air conditioning, poor nutrition, lack of exercise, stress, and swimming in chlorine or salt water, can also dry out or damage hair. No matter if you are born with dry hair or if your brittle locks are the result of too much time with the blow dryer, you can save your hair from dryness with just a few easy steps. Start from the inside and make sure you are drinking plenty of water and getting lots of vitamins and minerals in your food. 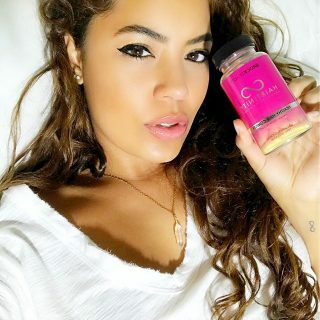 If you’re not sure whether or not your diet is giving your hair what it needs, try a supplement. 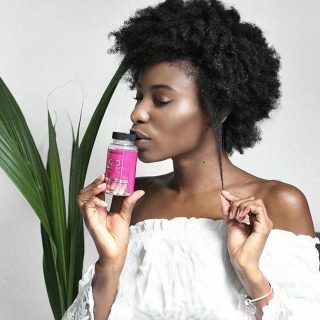 Hairfinity hair vitamins are a great source of all the vital nutrients to keep your hair growing stronger, longer, and healthier. You don’t have to give up your daily coffee but remember that too much caffeine prevents your body from absorbing minerals properly and you need those minerals for healthy hair. Take small breaks from the hustle and stress of daily life, and give your hair a break now and then by letting it dry naturally or choosing a mild shampoo and conditioner. For immediate hair repair, however, start using a deep conditioning hair mask for dry hair once a week. There are plenty of good ones to choose from that are simple to make and budget-friendly. You may even have the makings of a great hair mask in your kitchen right now! To give your weekly hair mask for dry hair a boost, make sure your hair is clean and consider using a plastic shower cap or a plastic bag to wrap your hair in while the mask sits. Some of these masks take 20 minutes to an hour to work their magic, so why not use that time to de-stress? Dim the lights, put on your favorite relaxing music, put your feet up and call it “spa time”. All of these masks will add moisture to your hair but we’ve noted those that are for very dry hair. Depending on your hair’s length and thickness you may need more or less of each mask. Experiment to find the hair mask for dry hair that is just right for you. This mask is one of the easiest because there are only two ingredients and chances are you’ll have one or both in your kitchen. Honey is an emollient which means it is a natural softener and it also improves the health of the hair follicles which are responsible for hair growth. Researchers say that proper use of honey in the treatment of hair can wake up the sleeping hair follicles which boost the growth of hair. Honey is also a natural antioxidant, so it will make your scalp healthy and stimulate hair growth. Finally, honey’s high sugar content helps your hair retain moisture. In a bowl, mix honey and olive oil well. Apply mixture to clean, damp hair and massage gently into scalp. This time we combined the honey with coconut oil for extra silkiness. Honey and coconut oil work together in perfect harmony. Coconut oil, when added to honey, helps to seal in honey’s moisturizing action. Allow to cool, but not enough so that the coconut oil hardens. Apply to wet or dry hair, concentrated on vulnerable areas and ends of the hair. Comb through with your fingers or a wide-toothed comb and massage gently to cover from root to end. This recipe makes a large batch and it’s a bit time consuming but you can freeze the leftovers it’s excellent as a natural relaxer and deep conditioner for very curly hair. Both the honey and the molasses are natural humectants with moisture and protein benefits. The olive oil is good for lubrication and helps retain moisture. Banana is good for moisture and also contains protein benefits. Water helps thin the mixture, while corn starch thickens. Wheat germ oil is added for strength and lubrication. And apple cider vinegar gives hair shine. Place all the ingredients except for the water into a blender and process until smooth. You may need to add the water bit by bit if it looks too dry. To ensure that there are no bits of banana in the mixture, sieve it through a fine sieve. Pour the mixture into a saucepan and put it on a medium heat while stirring constantly. You don’t want to ‘cook’ the mixture but you want the cornstarch to cause it to thicken and this will take moments. You may need to add more water to thin it down if it gets too thick or add a bit more cornstarch if it is still too runny. You want to end up with a caramel coloured mixture that is the consistency of a thick batter. If the mixture is too thin it will start dripping from your hair as soon as you apply it. Decant the mixture into a container, depending on the length of your hair it will likely be enough for two applications. To apply, divide the hair into 3-4 sections and clip. Starting with 1 section, part the hair and apply on the roots generously rubbing in with your fingers. Once applied on the roots of the section, apply the mixture all the way to the ends. Complete all sections in this manner and once done, cover the hair with a plastic cap. Let the mixture sit in your hair for 1-2 hours or overnight for really dry hair. Wash hair with a sulfate free shampoo, deep condition and style as usual. You can freeze the remainder until you are ready to use it again. The treatment is suitable for both natural and relaxed hair. Mayonnaise contains oils which help nourish and moisturize your hair from deep within. It is considered very useful for dry and damaged hair. The vinegar in mayonnaise helps restore the healthy pH balance to your otherwise damaged hair. And the oils also create a coating on hair strands to protect them from the harsh effects of the sun. The monounsaturated fatty acids, phytosterols, and high levels of antioxidants like vitamin E in avocados are well absorbed into our scalp and hair shafts. This not only has a highly moisturizing and protective effect against environmental stressors and damage, it may also stimulate new growth and help unclog blocked follicles. In a bowl, mash avocado and banana until no large chunks remain. Add olive oil and mayonnaise and mix well. Apply to hair and let sit for at least 30 minutes. Shampoo and condition hair as normal. Finish off by rinsing hair with apple-cider vinegar. (1 teaspoon vinegar: 1 cup water.) This final step is optional, but keep in mind that the vinegar adds shine and balances hair’s Ph. The challenge with dry hair that is also thin or fine is to condition without adding too much weight to the hair. Banana is perfect for fine hair—deeply moisturizing without added heaviness or oil. You’ll go bananas over what potassium can do for you— it’s great for strengthening and thickening fine hair. Bananas nourish the scalp and hair follicles, help maintain natural hair elasticity, and prevent breakage and split ends. 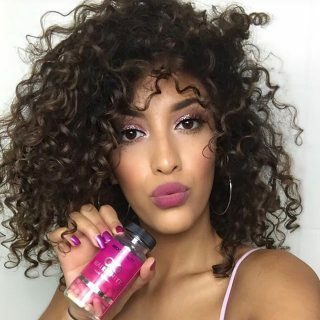 Dyes and bleaching are often the cause of our dry hair but the question is how do you put moisture back in without risking the vibrant new color of your hair? Rosemary and olive oil have appeared in numerous herbal and home remedy books to treat damaged hair and because they’re light, they won’t affect your color. Rosemary stimulates new hair growth and protects against further damage, while olive oil comes packed with nutrients. Regular use of rosemary oil helps to stimulate follicles, making hair grow longer and stronger. It is also believed that rosemary oil slows down premature hair loss and graying of the hair. Rosemary essential oil is also beneficial for dry and flaky scalps. Regular massaging of the scalp with rosemary oil nourishes the scalp and removes dandruff. Gently heat olive oil in a pan until it becomes warm, but not hot, to the touch. Remove from the heat and add 5 drops rosemary essential oil. Apply the oil to your head, saturating strands with the mixture. Cover your head with plastic wrap or a shower cap. Leave on at least 20 minutes. You can keep any leftover rosemary olive oil in the refrigerator and reheat for weekly use. Why suffer with dry, brittle damaged locks any longer? A weekly hair mask for dry hair will infuse your hair with new life, make it radiant, manageable, and full of body! Remember that it is essential to treat your hair from the inside out. 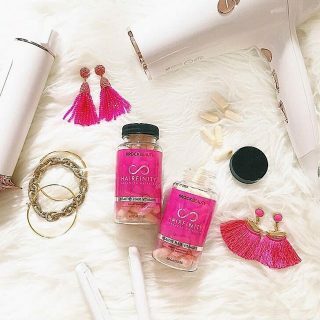 Hairfinity hair vitamins are a nutritional supplement proven to make hair stronger, longer, and healthier.